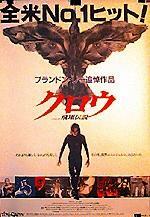 A rock musician (Lee) comes back to life as the "Crow," a mystical near-invincible killing machine, to take revenge on a gang leader (Wincott), whose men raped and killed his girlfriend. The Crow was a hit movie in the US and has gained a steady cult following through the years, mostly because of Lee's death during the making of the film (he died when a stunt gun misfired during the boardroom shootout). Don't get me wrong, there's nothing terrible about the movie, but if Lee had lived, I don't think it would be as popular as it is today (spawning two sequels and a TV spin-off, as well as a "Crow" like wrestler). The Crow is a good example of style over substance. While it looks great (it really captures the feel of a dark, gothic world), The Crow is quite boring in parts. There's way too much time in subplots with the supporting characters. I don't know about you, but if I was brought back from the dead, I'd want to take revenge a lot quicker than the Crow does. The acting is average at best. Lee is alright, but mostly all he has to do is grimace and spout one-liners once in a while. Most of the other cast members range from dead wooden to plain average, and, oh yeah, there's an annoying kid in there too. The only standout is Wincott, who always plays a good villain. Actionwise, The Crow is limited at best, lacking the punch of many HK (or even the better US) films -- though it is fairly gory for a US action movie. There are some good bits, such as when the Crow kills off a pawn shop owner by using pawned jewelry as "shells" in a shotgun. Lee doesn't show off too much in the way of martial arts, instead using guns for most of the picture, so you may be disappointed there (though, truth be told, he didn't really have much of the martial arts talent of his father). The finale also features a ridiculously stiff sword fight that uses every cliché in the book, except for the way the Crow finally kills off the gang leader, which is pretty cool. Probably worth seeing once, but don't kill yourself rushing to the video store, and stay away from the horrid sequels.